Trek along one of the world’s most iconic structures and help us to support more families who have a seriously ill child. The adventure takes you from the ‘Wild Wall’ at Guibeko with its crumbling paths and ruined watchtowers to the restored ‘postcard’ views of Mutianyu and Badaling where panoramic views stretch to distant misty mountains over peaceful woodland and terraced fields to exposed ridges and majestic peaks. Away from the wall, you’ll also spend a day trekking in the Black Dragon Pool Park, a spectacular nature reserve set in a deep valley with waterfalls, towering cliffs, crystal clear pools and traditional Chinese buildings. As you complete your 45 km trek after 5 days you’ll head back to Beijing for a celebration and some exploring of one of the world’s most fascinating cities. 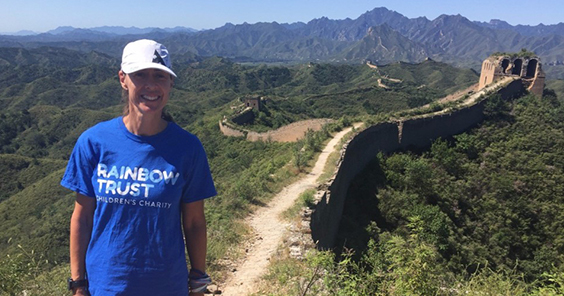 If you are already trekking the Great Wall of China or if you’d like to self fund your trip please still get in touch as we will still provide the same level of support, and we’d love to have you on our team!